Register Log In ECN Forum Forums Photos for General Discussion USE Cable - No Conduit! Another example of why a licensed electrician should be required to do anything more than changing a light bulb. Does anyone still use meterpans like this in their areas for new installs? Our Utility (Lipa - was Lilco) has required us to use 200A OH/UG meterpans w/manual bypass. We have to use the same for 100, 150, or 200A. I notice that our pans (or cans by you?) have the neutral connection out of the 'drip zone'(center) and on the side. I think that was a very good design change and was wondering if others had that feature? This was an existing SE built with 200 amp (2/0 cu) line side and 100 amp SEC load side of the meter socket. The customer (I work for Alliant Energy in SE Iowa)wanted to upgrade to a 200 amp load panel and do it himself, since an electrician costs too much. Using a licensed electrician would have saved him money in the end. New meter sockets in our area now require horned bypass on residential, and a lever bypass on commercial. 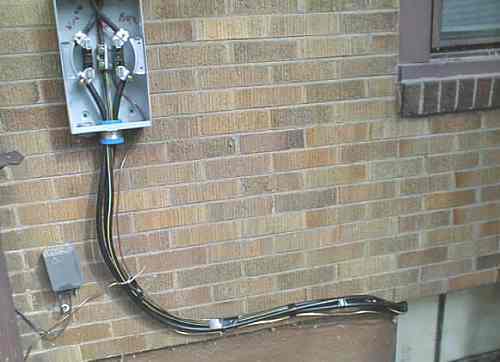 In central Minnesota Xcel Energy (formerly Northern States Power) requires a manual bypass in all meter sockets (here it's a "socket") whether residential or commercial. In the generic single phase configuration, the neutral is directly under the hub location. We still use those but we usually put a cover on them, and are required to bond the service Panel. The ones with c/o are reserved for commercial. I have seen some schlocck installations but this has got to be a classicc. talk about dangerous! one wrong move with a mower,"KERBOOM". did the power company actually hook this up? CONDUIT!!! we don't need no stinkin conduit. man that is an original. goin to have to show that to my new class as what not to ever do.